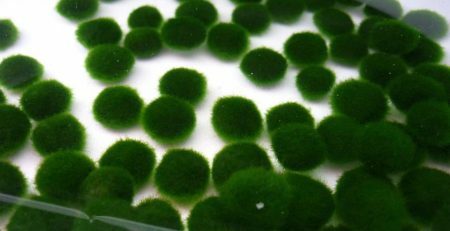 Marimo is the name given to a type of land locked algae formed by many small strings of algae tangled together in a radial pattern forming a fuzzy green ball. 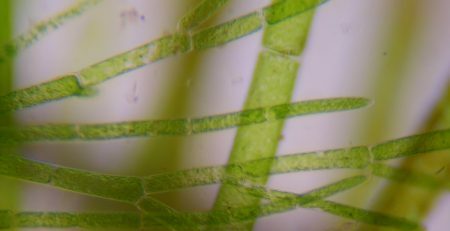 Though round Marimo are unique only to Lake Akan, other similar algae can be found in several lakes in Japan and the world. 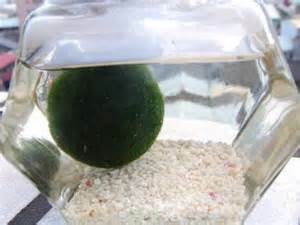 Current studies show that the same family with Marimo can be found in Austria, Germany, Holland, Indiana and New York States, USA, and Siberia, Russia. 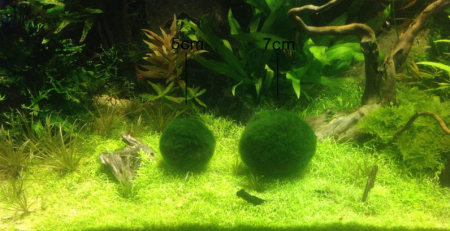 Due to the large size and ball like roundness of the Marimo in Akan, the Marimo is regarded as an asset to all of the world. 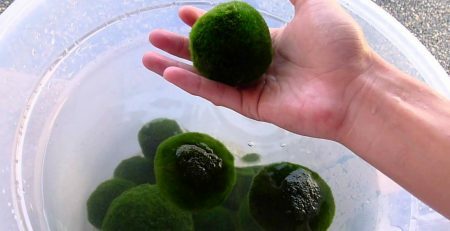 It takes more than 100 years for natural marimo algae to grow to a diameter of 10cm, but the marimo algae in Lake Akanko are the largest in the world, growing to a diameter of 30cm. Back in the old days, one could just walk down to the water of Lake Akan and take home one’s very own Marimo, but times have changed and the safety of the Marimo is at risk. In post war Japan rapid development occurred throughout the country, Lake Akan was no exception. 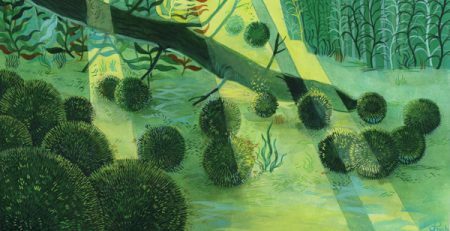 Forestry north of Lake Akan and the use of Akan water to run hydroelectric plants are two of the initial causes to jeopardize the Marimo habitat. Logging upstream dirtied the shallow waters of Lake Akan, thus reducing the exposure to sunlight necessary for the Marimo to photosynthesize. Reduced water level caused by supplying hydroelectric plants also left many Marimo on the shore to die in the sun. The environment was second to development at the time, but the Association for Marimo Care Tenders as well as the Ainu community here in Akan, took measures to bring back Marimo. Initially the movement started with a nation wide attempt to have people return the Marimos taken away from Akan as souvenirs. 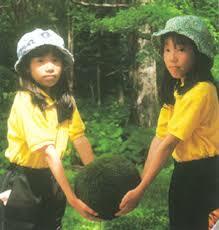 People from all over the country cooperated and returned their precious Marimo. 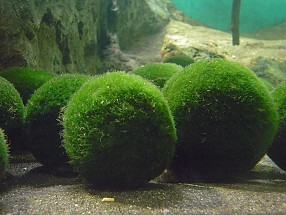 This was followed by the Marimo’s registration as a Special Natural Monument of Japan in 1952. The Ainu as well created the Marimo Festival shortly prior to this in 1950, to honor its existence. Affection for the Marimo has led to community wide support for protection of the environment. It has also grown into a huge tourist attraction. Though measures to protect Marimo have been ongoing for many years now, the Marimo habitat is still unstable. Most of the lake used to be suitable for Marimo to grow, but currently there are only a few areas in which they grow. Tourists are only able to see Marimo at the visitor center or the Marimo Museum. Artificially grown Marimo are available in glass bottles in souvenir shops lining the streets. Marimo have gone from being a hardly know green ball of algae to being a symbol of the community and natural environment of Akan. This symbol in itself creates a unique attempt to preserve the environment. People all over the country now know and adore Marimo. At the same time the tourist attraction of Marimo itself creates new environmental problems. The tourist industry buses, boats, hotel waste, etc. 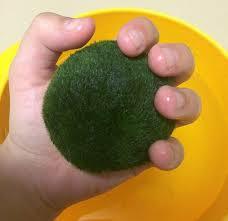 itself are bound to effect on the Marimo habitat. As much of the economy here relies on tourism, the dilemma of environmental protection vs. economic stability is a problem. Marimo have captured the hearts of many and are symbolic to the environmental movement; I hope that the natural environment for Marimo as well as for the people of Akan continues to grow strong.